Discover a better way to manage your finance operations, today. Creating a budget is always a good idea, but it’s even more crucial when you run a business. Failure to properly budget can seriously impact your bottom line, and even jeopardize the success of your enterprise. By making and following a budget, you can better control costs, avoid overspending, and plan to meet financial goals. To help you get started, we’ve created a variety of business budget templates for Excel that you can use for any organization - from startup companies to established enterprises. Download the template that best fits your needs, and start planning for financial success. What’s in a Business Budget? You may also choose to include additional information in your budget, depending on your business size and the level of financial information you want to track. For example, if you run a startup, you may want to include data on the total cost of getting your business up and running, as well as the amounts and sources of investor funding. If you have a large enterprise with multiple branch offices, you may want to create separate sheets for each location, as well as for the company’s overall budget. Gather historical information: If you have an established business, collect historical data on operating expenses, salaries, sales, and revenues over time. If you’re starting a new business, look for financial information on a business similar to yours (in size and type) and use it as a benchmark. Estimate sales and set profit goals: Calculate the sales you expect to make during different times of the year, factoring in holidays, office or plant closures, and seasonal booms and lulls. Set profit goals, and make realistic revenue projections for the year and into the future. Determine fixed and variable costs: Calculate all the fixed costs involved in operating your business such as rent, insurance, and business licenses. Also determine estimates for your variable costs, including materials and equipment, labor, salaries for company executives, employee benefits, and training and travel expenditures. Calculate your profit margin: To determine how much profit you expect the business to make, subtract your expenses from estimated sales and revenues. Include the total cost of goods sold (the total amount it costs to produce your product or service), and factor in other costs like shipping, equipment, and materials for your office or production facility. Adjust your budget over time: Continually update your budget over time to see how your estimates compare with actual sales and expenses. If you’re not making a profit, try adjusting your budget to increase revenues and decrease overhead costs. 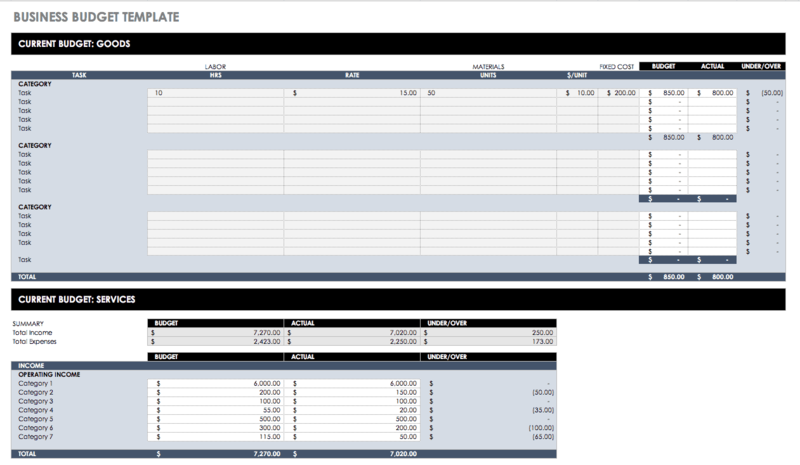 Use this basic business budgeting template to track monthly income and expenses for companies of any size. 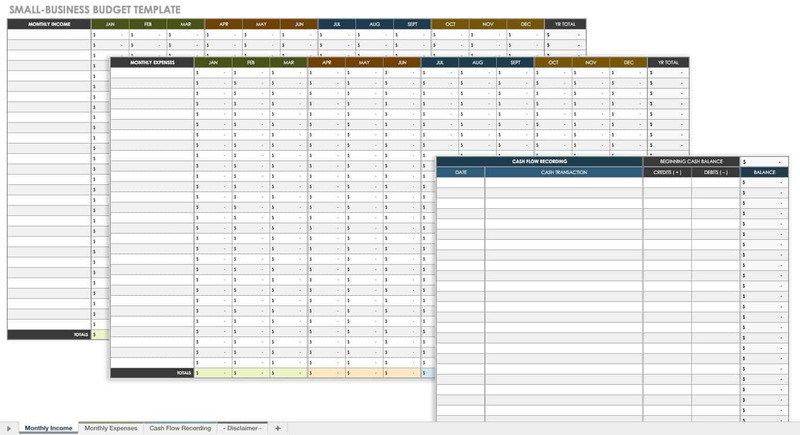 This template has separate sheets to create budgets for either services- or goods-based businesses. Income and expenses are also broken down by category to provide a closer look at where company funds are made and spent. For a more detailed view of your company’s financials over time, use this business budgeting spreadsheet. Enter your revenue and expense estimations for each month and the entire year. Then, add your actual income and expenditures month by month to see how closely you’re meeting your budget (the accuracy of your estimates). Income and expense categories are broken out, so you can clearly see where funds are going to and coming from. To make sure your department is staying within its allotted budget, use this Excel business budget template. It allows you to plot yearly income and expenses for a company or academic department, and compare the percentage change year over year. View revenue and expense subtotals by category to see where you can make cuts, and identify any surpluses. For larger, more complex businesses, you need more comprehensive business budget plans. This detailed spreadsheet tracks all the information you need to make important financial decisions — from startup costs to sales and operating expense forecasts. Estimate and track payroll costs, accounts payable and receivable, the cost of goods sold, lines of credit, and monthly fixed costs. You can also compare year-end totals against one another. If you’re getting ready to launch a startup, a small business budget template can be a useful tool. This basic calculator can help you quickly gauge costs for your new venture and estimate your first-year business income. It also includes a column for plotting monthly personal expenses, along with available cash from savings and other sources. This way, you can estimate the amount you’ll need to get your new business off the ground. 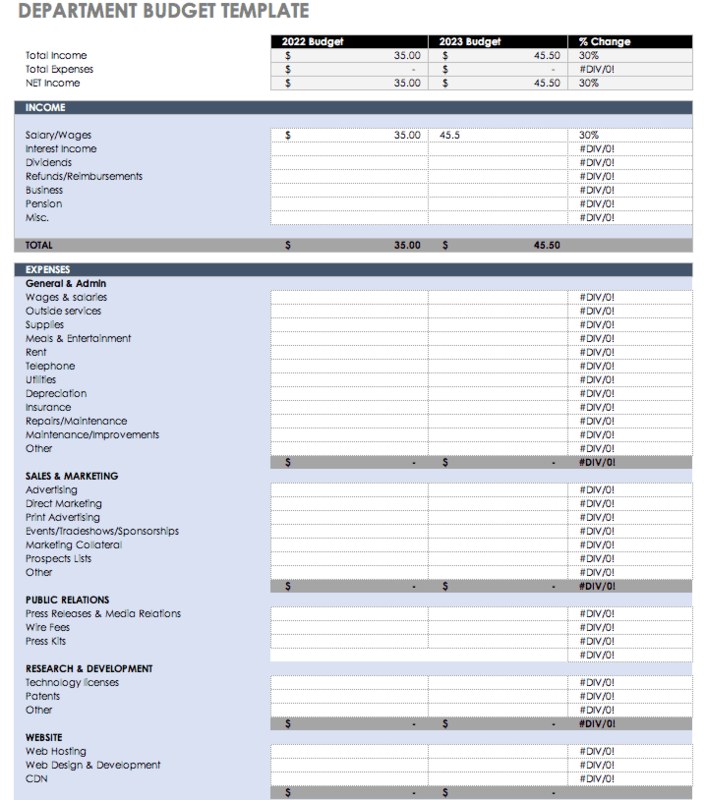 This comprehensive budget template is ideal for larger, more established businesses: it offers one sheet for estimated expenditures (labor costs, office expenses, marketing spending, travel fees, etc. ), and another sheet to plot expenses that accrue. It also allows you to track expense variances and offers charts for analyzing how closely your business is adhering to its budget. Need to create a specific, detailed budget for a particular job? This business budget worksheet can help you track income and expenses at the individual project level. Calculate labor, materials, and fixed costs for individual tasks across different categories, and compare estimated against actual expenses and revenues. Keep per-project spending under control with this business budget spreadsheet. If you run a small business or are self-employed, use this small business budget template to track and manage your finances. This basic budget planner has one sheet for tracking income sources, one for expense types, and another for cash transactions. Easily track monthly income and expenses and calculate total profits. Are you opening a new business? Using small business budgeting templates can help you manage finances properly from day one. If you plan effectively, you’ll lay a strong economic foundation for your company as it grows. This small business budget template allows you to track estimated versus actual funding sources and amounts, determine pre-opening costs, and calculate ongoing expenses so you’ll know how much income you need to come out ahead. Managing and tracking your business budget against actual expenses is a crucial step in ensuring that your business lands all projects within the bounds of its bottom line. In order to accurately manage business expenses throughout all phases of a project, you need a collaborative, real-time tool that helps you stay on top of your expenses, and even manage unforeseen budget issues as they pop up. Smartsheet is an enterprise work execution platform that is fundamentally changing the way businesses and teams work. Over 77,000 brands and millions of information workers trust Smartsheet to help them accelerate business execution and address the volume and velocity of today's collaborative work. Use Smartsheet to boost visibility into your finance operations. Make real-time updates and share details with stakeholders to increase transparency and accountability. Self-service reports and dashboards in Smartsheet ensure that everyone is working with the most up-to-date information, so that no detail is missed and you are able to make the right decisions at the right time. Try Smartsheet to discover why professionals around the world use it to manage their finance operations.